The drivers in attendance during Champions Week had a mind-blowing resume between them. The 12 drivers from NASCAR’s Touring Series (including Peyton Seller, the National Dodge weekly Racing Series champion) had a total of 1,780 NASCAR starts, 211 victories and 33 championships combined. Justin Diercks (Midwest Series) and Jeff Fultz (Southeast Series) all repeated their titles and returned to New York. Both Grand National champs also came back (Andy Santerre in Busch North and Mike Duncan in the West Series). Tony Hirschman also repeated on the NASCAR Whelen Modified Tour. The two first-time short trackers in New York were Peyton Sellers and Junior Miller. Sellers was this year’s NASCAR Dodge Weekly Racing Series National Champion and Miller was the inaugural champion on the NASCAR Whelen Southern Modified Tour. There were a few common themes among the champions in New York. Friendship and comradely were a few, but the most common theme was respect. Everyone who made it to New York appreciated the accomplishments of everyone else who made it there. “We definitely have a lot of respect for each other,” said NASCAR West Series champion Mike Duncan. “I think that six or seven of us at least are returning, so we’re all pretty acquainted with each other. It’s been a great time." Everyone had a good time hanging out with each other too. 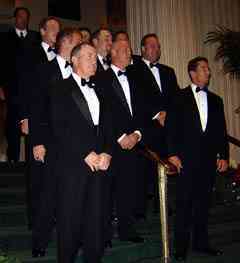 Some of the returning champions had so much fun last year at the 2004 version of Champions week, that they were still telling stories this year. The most interesting one involved some New York City shopping – on the streets. You might notice that one driver is going to be absent when it comes to this batch of leftovers. NASCAR Southwest Series champion Jim Pettit, II won’t appear in this particular story and it’s not because he was tongue-tied in New York City. It was quite the opposite in fact. Pettit had so many good stories to tell, that we will give him his own one-band-man version of Champions Week Leftovers coming up soon on Speed51.com. “We watched Andy Santerre buy a knock-off Rolex,” said Jeff Jefferson. “That was an experience,” said Dionne. So we just had to ask Santerre about it. Santerre knew which watch that he wanted fairly quickly, but negotiating a deal wasn’t as easy. Santerre and the watch seller struck up a quick bond – at least that is what the vendor wanted the champion to think at least. Did the Jeffersons take advantage of the deals on the street as well? Not all of the deals were made on the streets of New York though. Justin Diercks and his girlfriend Kelly got to spend some quality time together after a long racing season, and they managed to do a little bit of shopping as well. There was a lot that the champions of the NASCAR Whelen Modified Tour, Tony Hirschman, and the Whelen Southern Modified Tour, Junior Miller, had in common. Both men are soft spoken and prefer to do their talking on the racetrack. They are both considered to be the masters of their crafts with a baker’s dozen of touring Modified championships between them. And in New York, they were two peas in a pod. They talked about everything from racecars to race tires to their competition. And they could be around each other more in 2006. Junior Miller’s #69 Riggs Racing team might show up at some Whelen Modified Tour races up North this coming season. 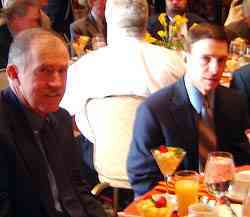 The head table at the NASCAR Nextel Cup banquet had some connections to the NASCAR Busch North Series. Champion Tony Stewart was led to his second Cup title by crew chief Greg Zippadelli, who used to turn Busch North wrenches for Mike Stefanik, and Team President J.D. Gibbs, who ran a season in Busch North as a driver back in 1999. Back then, the series was led by Busch North director Bunk Sampson, who passed away a few years ago after a battle with cancer. Gibbs believes that the series is a great stepping stone for up and coming drivers. But don’t look for any of the Joe Gibbs racing driver development teams to spend much time up North. Gibbs learned in 1999 that traveling to Northeastern events from a shop in North Carolina wasn’t much fun. Southeast Series champion Jeff Fultz is also familiar with the Busch North Series. He competed in the July, 2004 event at New Hampshire International Speedway driving for car owner Jerry Morello in a surprise appearance. Fultz finished 33rd in that event and got to make a friend at the same time – four-time defending Busch North champion Andy Santerre. Many of the champions had never been to New York City before winning a NASCAR title. Tony Hirschman wasn’t one of them. The Pennsylvania driver has ties to New York City. His car owners, the Kehley family, are from Brooklyn and his race hauler passes through the NYC area on its way to many Modified events in New England. 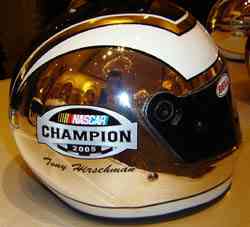 At one point, the Kehley team was based in the Big Apple, but after Hirschman came to the team the car started to be housed at Hirschman Garage and Speed in Pennsylvania. As the NASCAR champions were in New York, the Snowball Derby was in full swing in Pensacola, Florida. Speed51.com covered both events extensively and at least one Nextel Cup star was thankful for that. 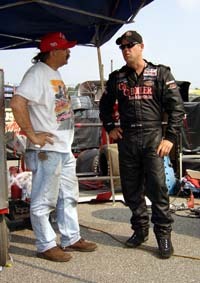 Rusty Wallace’s son Steve won the Derby in 2004 and finished second this year. Steve’s proud father kept track of his son’s progress all week long and told several interested observers to check out 51 to see how Steve was doing in Florida throughout practice, qualifying and the race itself. As the NASCAR Champions were returning from dinner in a pair of rented vans on Wednesday night in New York, a familiar face was seen walking through Rockefeller Center with his wife. NASCAR Nextel Cup driver Jeremy Mayfield was taking in the sights of New York and the Champions party made sure to say hello when driving by. Junior Miller won seven SMART championships before NASCAR entered the world of Southern Modifieds this year with their Southern Tour. That meant that Miller’s 2005 title was the first one that he earned under NASCAR sanction. He was very impressed with the benefits of that. As a NASCAR national champion, young Peyton Sellers got several tangible items for winning the NASCAR Dodge Weekly Racing Series National Championship. 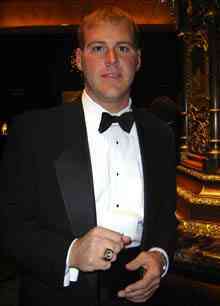 None is more significant though than his first NASCAR Champions ring. Jeff Fultz got to spend time with all of the champions in New York and he had fun with them all. 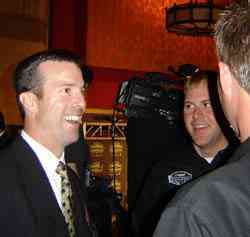 But he especially liked swapping stories with NASCAR Craftsman Truck Series titlist Ted Musgrave. Jeff Jefferson was able to enjoy his third straight trip to New York City based on his back-to-back-to-back Northwest Series championships. Does Jefferson think about Champions week when he is battling for points during the year and possibly try a little bit harder to get back to New York? New York City is a high fashion place and all of the champions’ wives and girlfriends looked the part. 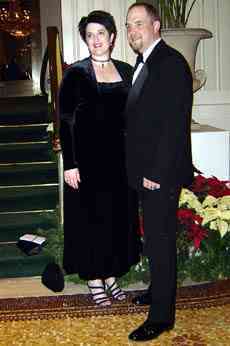 But doing so didn’t need to break the bank as Sue Santerre proved with the formal dress that she wore to Friday night’s Nextel Cup banquet. 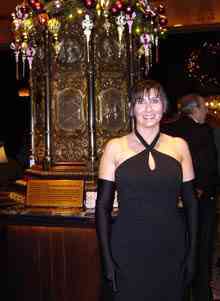 Did NASCAR Busch North champion Andy Santerre put his wife on a budget when it came to buying the dress? Not at all. Peyton Sellers will leave his hometrack, South Boston Speedway (VA), next season to compete in the NASCAR West Series as a development driver for Richard Childress Racing. This year’s West champion Mike Duncan is looking forward to Sellers’ arrival. When asked what his favorite moment in New York was, Jeff Jefferson didn’t need to think much. Meanwhile, Mike Duncan was hard pressed to come up with just one favorite moment in the Big Apple. Champions week wasn’t just a hit for the NASCAR champions. It was also a hit for NASCAR itself. 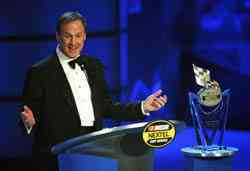 “The week is very special,” said NASCAR’s Don Hawk. “It gives us time to assemble the best of the Country from Grand National, Elite, Modified and the Weekly Series and have them mingle with the Cup, Busch and Truck Champions - both formally and informally on the clock and after hours with more freedom for all.